Teri Palmer, a long time Eastern Plumas Health Care employee, has worn many hats since she started at the hospital in 1985. Currently, she serves as Registration Clerk at Loyalton Medical Clinic, where she is updating the look of the Clinic’s interior by reaching into Loyalton’s past. Palmer’s family has lived in the Sierra Valley for eight generations, counting her grandchildren. At one point in the late 1980s – early 1990s Palmer says her “entire family worked here. Myself as CNA, Toni CNA/lab, Tami secretary to the Director of Nursing, my mom in the kitchen and dad in the maintenance department.” It’s easy to see what a big role this hospital plays in the lives of community members in a small towns like Loyalton and the other towns lining the Sierra Valley– they seem to live closer to their roots. It’s nice to be reminded, as well, of the vital role a family like Palmer’s plays in the life of the hospital. In explaining her Clinic redecoration project, Palmer said she saved years’ worth of Loyalton Museum Calendars. Milton Gottardi, who started the Museum and put the yearly calendars together, was also one of Palmer’s teachers. Now, Palmer is repurposing those calendar pages as framed pictures that brighten the Clinic walls. An added bonus is that the photos have been conversation starters for Loyalton, Portola, and Graeagle residents who come to the clinic for a medical appointment only to get a chance to revisit their past. According to Palmer, many of these Plumas and Sierra County residents have been coming here for their health care for a lifetime. Some point to photos from the late 1800s and find a grandfather or an uncle. Many have accompanying stories to tell—including Palmer herself. Palmer points to a photo of what appears to be an old wooden cabin, complete with two children, a rooster, and two women. The woman in the foreground is Ms. Stout, the Postmistress, and this frontier outpost is Purdy, just north of what is now Bordertown. The photo next to it shows letters that travelled between Purdy Station and Summit (Beckwourth Pass) in 1892. They were mailed between Palmer’s great grandparents before the two were married. According to Palmer, the pair wrote to each other every day. One letter begins, “Dear angel,” evoking a time and a place where, it would appear, the most important things were given more attention. Other photos show the first Loyalton hospital in 1915, logging with horses in 1905, building the first road between Loyalton and Vinton, moving Leon Dotta’s entire house with horses from Reno to Loyalton, and much more. Many familiar names, such as Dotta, Nichols, Belli, Grandi, Dwyer, Ball, and Dyson, which are still associated with this region and this hospital, appear on many of the pictures–Palmer has carefully cut out the calendar description that accompanied each photograph. 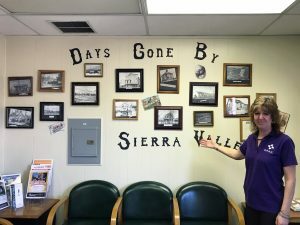 The photos tie current Sierra Valley residents to their past, and they also bring people together, prompting shared memories and acting as a reminder that these frontier towns and this one, small medical clinic, stand as unique and remarkable against the high speed cacophony of the surrounding world. 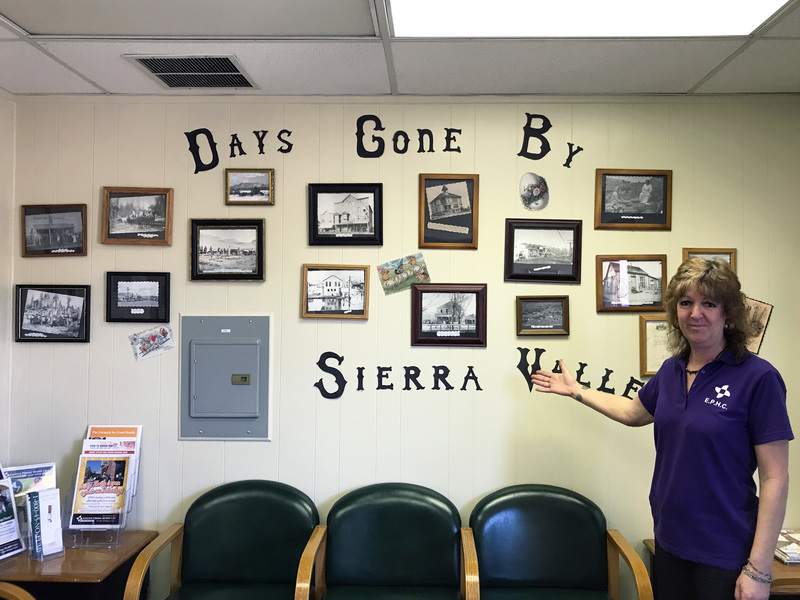 Teri Palmer stands with her Sierra Valley history project, which has brightened the walls and sparked memories among the Plumas and Sierra County residents who visit EPHC’s Loyalton Medical Clinic. Palmer serves as Registration Clerk at the Clinic.